If you enjoy having unique effects applied to your Windows desktop, then you might want to give the free Watery Desktop 3D a go. Watery Desktop 3D adds a flooded theme to your computer desktop and figuratively sinks your desktop beneath the water, giving your an aquarium look with fish. You're able to customize the type of effects on your desktop such as the number of waves, type of waves and how smooth the water is. Give your desktop a brand new look with this cool desktop/screensaver application and enjoy having a neat-looking desktop right on your PC. Watery Desktop 3D 4.01 is a shareware program and can be used as a demo to try the software until the free trial period has ended. A full version of the program is available after the trial period ends. For security reasons, you should also check out the Watery Desktop 3D download at LO4D.com which includes virus and malware tests. Additional screenshots of this application download may be available, too. 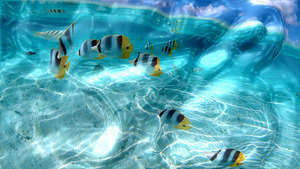 Watery Desktop 3D has a presence on social networks.